Except some of us won’t. Not everyone gets to go abroad, and I often get a little pang for the life I might have had at this time of year. I’ve never been to Paris, or many of the other places on my travel wish list: my last proper foreign holiday was in May 1996. I did have plans to buy some kind of disability friendly camper van or caravan, and travel with my disabled daughter, but that now seems unrealistic. The world of transport is moving so fast: I can’t justify the investment, when petrol and diesel vehicles could be banned in a few years time. And there’s another thing: I’ve read a few stories about non verbal children and adults who’ve died of starvation, because their sole carer died and they were unable to raise the alarm. If my daughter’s future is living with me, just me, then she needs a safety system, she needs a stable home, a year round day programme and regular home help visits, to ensure that she will be found and cared for if anything happens to me. Obviously this could change if real respite options that my daughter liked were made available. But I’m not holding my breath: I know the State has other priorities. Life has got a little easier in the past six months, as things have improved for one of my other children. It’s gone on a lot longer than expected, but it’s almost finished now, and hopefully our damp problems and other worries will be consigned to history. Yes, everything went wrong at once, and our ancient and complicated plumbing system packed up too. It took four visits by the poor guy who thought that all he’d have to do was service the boiler, but it’s finally working again. The kind of luck I don’t get very often: spotting a new bargain bin in Penney’s (Primark in the UK) with T shirts on sale for a euro, and in the right sizes for B and I. We got first dibs and I found 3 in colours and sizes to suit. By the time I’d tried them on, they were queuing to rifle through my leftovers. Maybe I’m showing my age, but I don’t believe a baby bottle brush should cost €10? So I held out until I had time to pop into Dealz and found one on sale there for €1.50. Never buy a Samsung American Fridge. I did, just for the extra storage. I believed the hype and the description, but I was so wrong. It leaks water. The frost free freezer has to be regularly defrosted, and the electronic controls cannot be controlled by the user: it is a fridge with a mind of its own. And in the hot weather, it was minded to warm up, so I’ve had to buy food on a daily basis and ensure that everything got eaten quickly too. Luckily, as the temperature outside drops, so does the temperature inside the fridge. I see less trips to Tesco in my future. Hooray! Hope you have lots of reasons to be cheerful this week too. Head over to Mummy from the Heart for more. It was just a little accident. Not the nicest way for my disabled daughter B to wake, but it was soon cleaned up, and she was full of smiles once again. She began sticking her tongue out at me, it’s one of the ways she communicates her needs. But it can mean several different things. So I offered a drink first. But that wasn’t what she wanted. She still needed to go. So I organised another trip into the toilet, with the help of her hoist. If you’ve been reading about my daughter for a while, you’ll know that I’ve been toilet training her for nearly 17 years. Surely a world record? But it’s not always easy. She’s non verbal so it can be hard to know when she needs to go. A regular toileting schedule helps, but enabling her to get to the toilet when she needs to requires a lot of things to go absolutely right. She has very weak muscles, so anything can upset her digestive system, from less exercise, to different food, to antibiotics or other medicines. So she does have accidents, and they upset her, they’re bad for her skin, embarrassing, unpleasant and undignified to clean up. And that’s at home. Things are ten times worse when we’re out and about. Because even if I thought it was okay, I cannot put my daughter on a dirty toilet floor to change her nappy: I wouldn’t be able to safely lift her back up again as my back is destroyed and she is an adult weight. There is a solution: Changing Places Toilets. I’ve mentioned them before, with good reason, because they would improve the lives of children and adults with severe disabilities in so many ways – and the backs of their carers. All our trips out, bar one, are cut short due to lack of these toilets, we can’t go far from home, and we can’t stay out for more than about 4 hours. Every trip has to be planned carefully so she gets to use the toilet just before we leave, and again as soon as we return. It’s very restrictive. It could be why some people who have been involved in her life don’t see the point of toilet training her at all. Some people seem to think it’s easier to let her soil herself and change her when they can: I’m pretty sure it happened in respite and may have been why she stopped enjoying it. Did I actually make her future life worse by toilet training her? People mean well, but if and when she lives apart from me – whether in residential or the community – I’m afraid the succession of minimum wage care workers are likely to do the easy thing, the thing they know how to do, the thing they do for others like her. They will change her at regular intervals, and after a while she will surely get used to it, as people get used to most things. But it makes me so sad for her that it will probably be this way once I’m gone. Unless there are some fundamental changes made to the lives of people with severe and profound intellectual and physical disabilities. And that can begin with providing Changing Places Toilets as a standard in every new development. They have the potential to change lives, change attitudes, it will give those people who need them the chance to take part in their local communities, to travel further afield without always worrying about the next toilet stop. It will make severely disabled people more visible, improve acceptance, reduce fear of the unknown. And it just might give my daughter and others like her the dignity of being able to use a toilet, instead of being left to go in a nappy. Today is Changing Places Awareness Day: it raises awareness of the need for special disabled toilets that also include hoists and changing benches – the only kind that my daughter can easily use. They are not especially big or complicated – but they can make a very big difference to the lives of those with severe physical disabilities. If you have a disability or care for someone who cannot complete this themselves, please would you do this survey and explain the importance of changing places. This year the days and weeks have meandered by, barely changing with the seasons. My disabled daughter’s adult service is year round, which is good for both of us, and it means she still heads off happily on the bus from Monday to Friday to all her activities and her friends. Occasionally I bring her out for the day, mainly as part of the Rainbow Junior Arch Club summer programme. My youngest is at home most of the time, regardless of season, while my eldest works two jobs, and they are now year round, so her busy routine barely changes either! Over the years I’ve looked forward to the holidays, dreaded the holidays, and now I barely notice them, as we slide into the summer months, apart from the sun and the sweat. Life just continues. There’s still appointments to go to, forms to complete, meetings to attend, friends to see. It’s comforting rather than cheerful, but comfort is something to be treasured too. I could tell you about the broken boiler, the building work that’s going well, but is taking 6 weeks instead of 2, and all the usual ups and downs of family life. But let’s look at the good things instead, a new Marvel film meant a rare night out with eldest and youngest, a coffee shop meet up to discuss club business (and more), and more festivals to attend with B. This time the Rose Festival in Dublin’s Clontarf, which is about a lot more than flowers. She wasn’t on the best of form, but these certainly made her smile! My disabled daughter’s social worker once asked me to name the one thing that would make our lives easier. It was not the answer she expected, and she never got back to me with any contacts! For now I continue to muddle through the endless breakages, breakdowns, problems and issues associated with living in a very old house, with some help from friends and family. I was reminded of that conversation this week when the shower riser rail crashed to floor and luckily no-one was in it at the time. I’ve fixed it for now with three nails and some Duct tape. I’ve no illusions about this being a permanent solution, but I don’t even know who to ask for help, as I don’t want to pay for a plumber and I’ve still no handyman. But feeling cheerful that it’s safe to use once again . Ok, so I wrote about our trip to Kildare Maze earlier in the week, but the excuse to get out and enjoy a road trip and some real countryside and fresh air made me giddy and happy too! My disabled daughter B never fails to surprise me. I knew something was up when I heard the giggle that told me she was doing something ‘naughty’. Well not really, but I played along anyway. I’d sellotaped a box to her tray to help support her elbow and make it easier for her to feed herself. It wasn’t very successful idea. But when my back was turned she managed to pull it away, and began trying to open it. It took her 20 minutes to do what she wanted, due to her limited hand function, but eventually she succeeded. If I can’t see you, you can’t see what I’m doing! It was obviously too soon to announce that my sleep problems were over. Too much much to do and B getting a bout of constipation meant I’ve been struggling to string a sensible sentence together for the past week. But not on Saturday. Seven hours of unbroken sleep and I had my most productive day in a long time – without ignoring the needs of the children either. 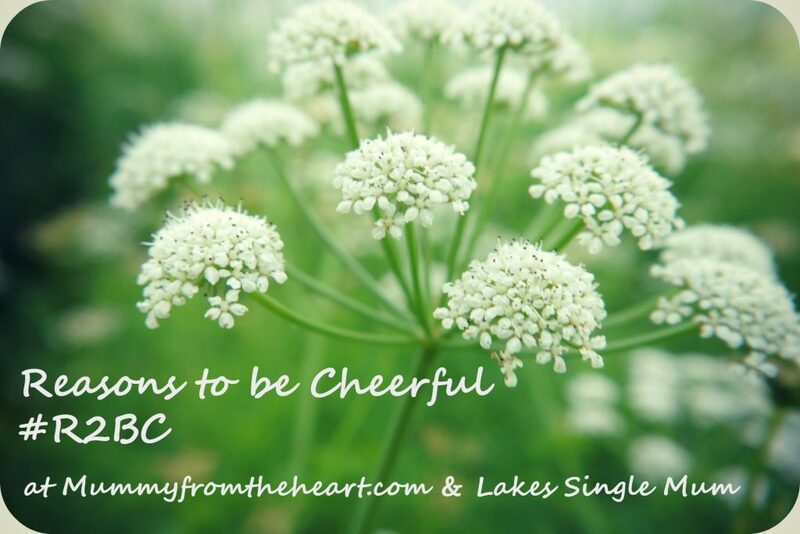 Hope you have lots of reasons to be cheerful too this week, and head over to Mummy from the Heart for more.